IT'S NOT easy being a truck driver. Especially when you've got to deal with other drivers on the road doing silly and dangerous things. Here's a few dash cam videos that show what some truck drivers see on the roads. Jeremy Greaves shared this video of a company ute to Dash Cam Owners Australia on Saturday. "Ute stops at nothing to get ahead of a road train and almost gets squashed against the concrete barrier," he wrote. Footage posted by Khaled Younes to Dash Cam Owners Australia shows how this quick thinking truckie avoided a crash early in the morning. 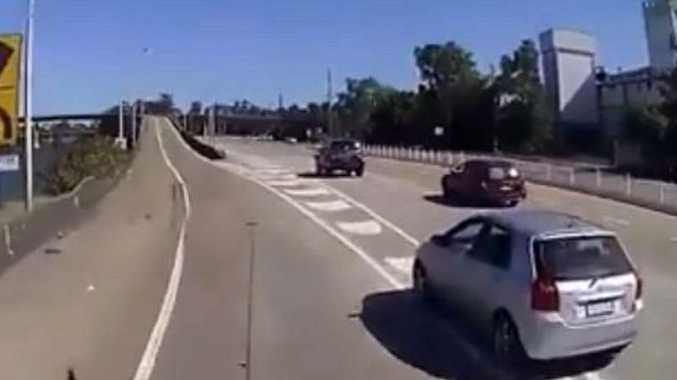 Jarrod Bligh was travelling northbound on the Hexham Bridge at Newcastle on January 6 when this car realized it was going to miss it's exit. 4. "He tried to race up the inside of the merge lane"
Jarrod Bligh also shared this video with Big Rigs, that was taken in April last year. "He tried to race up the inside of the merge lane and didn't make it," he said. "I had no idea he was there. The guy in the black ute witnessed it and said he raced up trying to beat me then just sat there. "(I) was all cleared by police and insurance as not my fault." Jarrod said the driver of the car was not hurt during the crash.